This new contender for mobile strategy war game supremacy comes in charging hard, swords drawn, loaded with enthusiasm and blood lust. 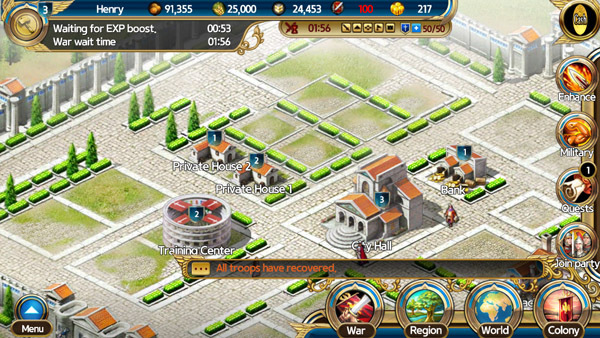 The official App Store listing lets out a boastful battle cry – “Get ready to experience the greatest war of Rise Of Rome which you never experienced before!”, they exclaim, promising to blow us away with advanced tactics, in-depth city building, and intriguing faction wars, all wrapped up in the epic story of the Roman Empire. It soon becomes apparent that all of that marketing melodrama doesn’t translate so well into the game itself. For all the talk about detailed strategic planning and relentless historical battle scenarios, once you’re getting into the action much of it falls flat. It’s not that there isn’t a game here – RNTS Media’s Rise Of Rome is a rather hefty strategy management title with surprising complexity – the problem is that the underlying framework isn’t really strong enough to carry this weight. The macro view is of a game struggling to cope with its own ambitions – there are many elements at play, presented via a cluttered heap of menus, info screens, upgrade paths, economic dynamics and so on, making it hard to stay focused on what you’re meant to be doing. Often you’re not even sure that your actions are having any real effect on proceedings. To compound the problem, your in-game helper takes a very haphazard approach to the English language. Some lengthy feature explanations are so clumsy that you end up skipping them altogether, and then regretting it later when you’re left scratching your beard. Often the impression, though, is that this is complexity for complexity’s sake – extra fluff to overshadow a weak game that lurks beneath. This facade of supposed intricacy and depth is noticeable throughout the game, a blatant attempt to disguise bad design by drowning us in complications. 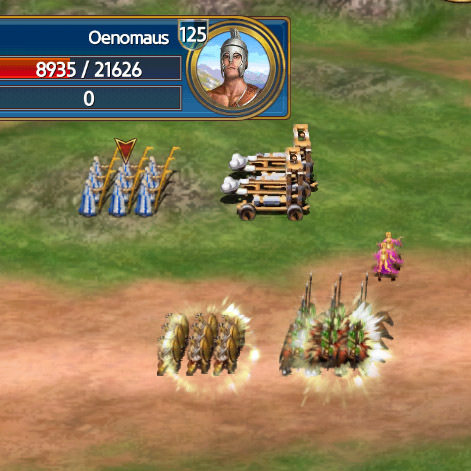 Visually Rise Of Rome has some quaint elements – the city building component is pleasantly illustrated with an Age Of Empires feel to it, and the various character graphics fit the theme well. The interface is quite cluttered though, an unfortunate byproduct of the complexity here. Screens filled with tiny text, percentages, buttons and numbers can be terribly overwhelming, enough to make the whole process a little exhausting. The battle element is by far the weakest aspect, in concept and in execution… dated and amateurishly animated. It doesn’t help that the war scenes aren’t much fun to play either – select your army, select the enemy, hit “attack”, and hope for the best. They’ll tell you there are countless parameters at play behind the scenes, but It still won’t be long before you’re hitting that button to auto-complete each skirmish. 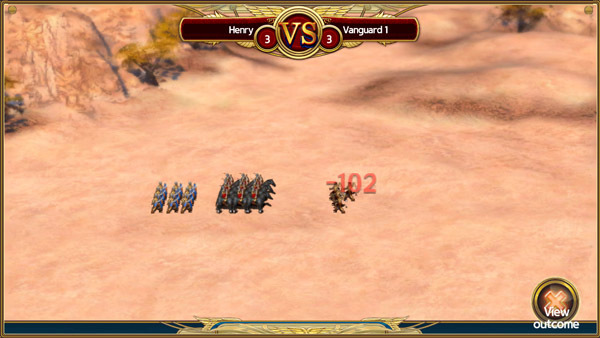 Social features are meant to be a big part of the allure of Rise Of Rome, but this aspect is weakly implemented and unclear, sometimes leaving you wondering if you’re even connected to other gamers at all. Still, with or without a social element, there’s a quite a bit to sink your teeth into if you’re a really patient and forgiving gamer. Sadly, try as it may, this game loses much of its credibility by nagging you for money from start to finish. Yes, Rise Of Rome takes the nefarious shape of freemium gaming, that most vile business model, and implements it with roguish efficiency. Coercive monetization, we call it. And it’s a horrible way to abuse your customers. Like most freemium products, you’re given a game which is programmed to annoy you in some ways unless you throw money at it. 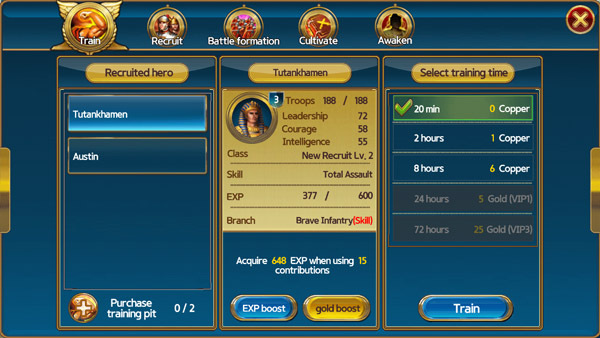 That doesn’t mean that you can’t play Rise Of Rome without spending any cash. Just be prepared to be held up at knifepoint every now and then. And even when you do open your wallet to keep things moving, too much of this game feels like you’re just pressing buttons and praying for progress. Within the realm of devious pay-2-play gaming there are far more engaging titles out there which offer the same core principles – the city management aspects, the battles, the social components – which leave Rise Of Rome looking rather stale. But, since it’s free, you may as well pick it up and find out for yourself, either on the iTunes App Store or the Google Play Store for Android users. Rise Of Rome requires iOS 4.3 or later. Compatible with iPhone, iPad, and iPod touch. This app is optimized for iPhone 5.